24 September 2016: Fall for the Book festival, George Mason University. “Slavery and Beyond: Recovering History through Family Memory,” discussion with author Karen Branan and historian Anthony Cohen. 3:00-4:15. Building: Research 163. Public parking in the Mason Pond deck. 2016 Split This Rock Poetry Festival: Poems of Provocation & Witness, April 14-17, Washington D.C. “Migration & Identity: Interrogating Privilege through Poetry.” Details TBA (we expect to hear the time of our panel soon). I will read from Trafficke and talk about the research, the Magruder history, and our responsibility to the truth of our personal family histories. My fellow panelists are Marcos L. Martinez, Sean Pears, & Benjamin Brezner. Open to all, though you must register to attend festival events. See the web site for reduced rates to students and those with low income. Sun, 28 Feb 2016: 2:00-3:30. Reading from Trafficke, with Karen Branan, author of The Family Tree (Simon & Schuster, 2015), her investigation of a “kinship lynching” within her family in Jim Crow Georgia @ The Writers Center, Bethesda. Check out Karen’s web site. Mon, 1 Feb 2016: 7:00-8:30: Reading from & talking about Trafficke, with Karen Branan, author of The Family Tree @ Busboys & Poets, Hyattsville MD. Tues, 17 Nov: 7:00. Reading from Trafficke, @ University of Illinois, Springfield. Great Room of Lincoln Residence Hall, 2160 Vachel Lindsay Drive, Springfield, IL 62703. Parking lots right by the building, I’m told. Fri, 16 Oct: 2:00-4:00. Presenting “20 Years of Trafficke: A Poet’s Expedition through History, Legend, Race, Genre,” @ American Folklore Society Annual Meeting, Long Beach, CA. Panel event #06-03: Performances & After-Words: Poets and Storytellers on Research, the Creative Process, & Beyond, with Margaret Yocom, Milbre Burch, & Joseph Sobol. Room: Centennial C.
Fri, 9 Oct: 7:00. Reading from Trafficke @ University of Colorado, Colorado Springs. University Center, Room 303. Follow signs in the building. Parking is open to visitors (other than handicap or reserved spaces) after 4:00 pm on Fridays. Sun, June 14, 5:00. House Reading, Springfield, IL. Please email for location & directions. Sat, June 6, 7:00. 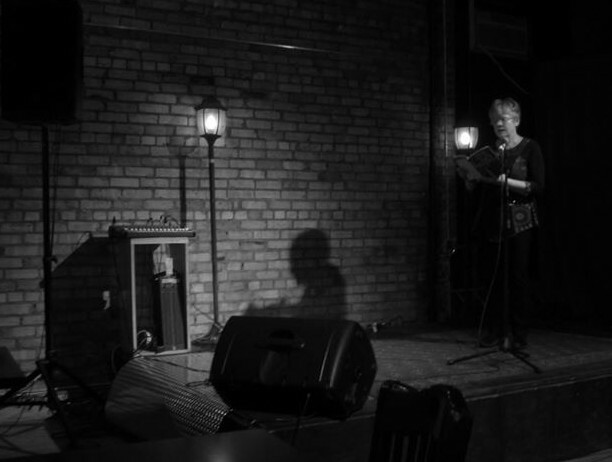 Reading from Trafficke at the Barrelhouse Presents, along with Lance Phillips & Matthew Rohrer. Upshur Street Books, 827 Upshur Street NW, Washington, D.C.. Wed, Apr 15, 7:30: Reading from Trafficke, with my colleagues Sally Keith, Eric Pankey, & Alan Cheuse @ GMU’s Spring Leaves mini-festival. GMU, Johnson Center, Room C.
Looking a little retro, at the Ahsahta Press reading on Saturday night! Thanks to Michelle Detorie for the photo. Thurs, Apr 9, 11:00-12:00: Signing copies of Trafficke, Gallowglass, & Bone Pagoda @ Ahsahta Press tables in the book fair, #1029 & 1031. Thurs, 26 Mar, 12:00-1:30: Twenty Years in Trafficke: A Poet’s Expedition through History, Legend, Race, & Genre. GMU Fairfax Campus, Robinson A, Room 447 (English Dept. conference room). Joining my colleague Beth Hoffman in a department colloquium. All are welcome. 13 Mar: Trafficke will be guest of honor at a Book Party & House Reading, D.C., by invitation.